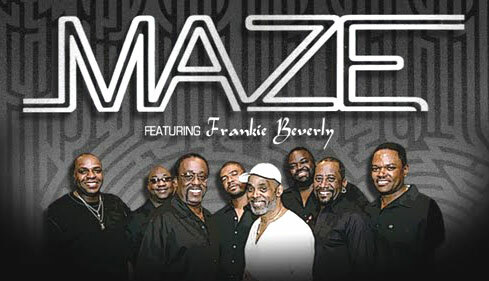 Raw soul / quiet storm band Maze Featuring Frankie Beverly is coming to Jones Beach http://MAZE.jonesbeach.com … special guests Patti LaBelle, The O'Jays, Kenny "Babyface" Edmonds & Tank... by any measure, one of the most talented but criminally underappreciated self-contained bands of the past three decades has been Frankie Beverly and Maze. Their ability to fuse soul and jazz with an irresistible groove and intelligent lyrical content has gained for them an extremely loyal following among Soul music fans and great respect among their performing peers, but little attention in the pop music world. Group founder and leader Frankie Beverly was born and raised in the musical city of Philadelphia, and began singing as a child in church. As an early teen he hooked up with 50s soul group the Silhouettes (who sang the doo-wop number “Get a Job,” which influenced Smokey Robinson’s first hit composition, “Got a Job”). By the early 60s, Beverly founded a doo-wop group called the Butlers and worked with future legendary Philly record executive and producer Kenny Gamble. The Butlers had significant local success, but never broke out nationally.